History has been made on the Korean peninsula today, as South Korean President Moon Jae-In and North Korean leader Kim Jong-Un shook hands at the Demilitarized Zone between the two countries and pledged to work to denuclearize the peninsula and to declare the official end to the Korean War. Today’s historic summit marks the first time a North Korean leader has ever set foot inside South Korea. During the meeting, North Korean leader Kim Jong Un said “I came here to put an end to the history of confrontation.” The North and South Korean leaders pledged to pursue talks with the United States aimed at negotiating a formal peace treaty to replace the uneasy 1953 armistice. For more we speak with Ann Wright, retired U.S. Army Colonel and former State Department diplomat. She is a member of Women Cross DMZ, a group of international peacemakers who have been calling for an end to the Korean War. The War and Peace Report. I’m Amy Goodman. History was made on the Korean Peninsula today. MOON JAE-IN: Kim Jong-un and I declared together that there will be no more war on the Korean Peninsula and a new age of peace has begun. AMY GOODMAN: Those were the words of South Korean President Moon Jae-in as he held a historic summit with North Korean leader Kim Jong-un. After shaking hands at the demilitarized zone between the two countries, the two leaders pledged to work to denuclearize the Peninsula and to declare the official end to the Korean War. Today’s historic summit marks the first time a North Korean leader has ever set foot inside South Korea. North Korean leader Kim Jong-un wrote in a guest book “a new history starts now. 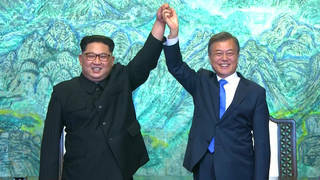 An age of peace, from the starting point of history.” Kim and his South Korean counterpart pledged to pursue talks with the United States aimed at negotiating a formal peace treaty to replace the uneasy truce that was brokered after the 1950-1953 Korean War. This is North Korean leader Kim Jong-un speaking today. KIM JONG-UN: We will make efforts to create good results by communicating closely in order to make sure our agreement signed today before the entire world will not end as just a beginning like previous agreements before today. AMY GOODMAN: Today’s breakthrough comes amidst a series of diplomatic developments regarding North Korea and its nuclear program. Last month, Kim Jong-un traveled to Beijing by armored train to meet with the president of China, Xi Jinping, in Kim’s first foreign trip since taking office in 2011. Kim is also slated to meet soon with President Trump, in what would be the first-ever meeting between a sitting U.S. president and a North Korean leader. Last week, North Korea announced it would stop testing nuclear weapons and ballistic missiles and would close a site where at least six prior nuclear tests were held. This is South Korean President Moon Jae-In speaking today. MOON JAE-IN: It is very significant that North Korea took a measure of freezing nuclear first. It will be a valuable beginning for the complete denuclearization on the Korean Peninsula. I clearly declare that the South and North will closely cooperate for the complete denuclearization. AMY GOODMAN: This morning, after President Trump tweeted against James Comey once again, he then tweeted, ”KOREAN WAR TO END! The United States, and all of its GREAT people, should be very proud of what is now taking place in Korea!” We go right now to Hawaii, where we are joined by retired U.S. Army colonel, former State Department diplomat, Ann Wright. She is a member of Women Cross DMZ, a group of international peacemakers who have been calling for an end to the Korean War. Ann Wright, talk about your response to what has just taken place on the Korean Peninsula. Did you ever think you would see this day? ANN WRIGHT: Holy smoke, no. This is just really remarkable. The last 12 hours have just stunned everyone, of the incredible, incredible work that has been done by the South Korean government with the North Korean government. And for them to have been able to come out with a communiqué, an agreement that is stunning, that has—I mean, I couldn’t have written it any better. All of the wants that we of the world who want peace for the Korean Peninsula, who could have written everything down—we couldn’t have added anything more to what they have come up with. It is really a beautiful, beautiful agreement, worked very hard by both governments. And I certainly hope the United States government will agree with all parts of it and that, indeed, the people of Korea will finally have peace on their Peninsula. AMY GOODMAN: As you mentioned, this really has been pushed forward by the South Korean president, Moon Jae-in. He campaigned on this and he has pushed very hard for this meeting. What is actually in the document that they signed, from the economy to denuclearization? ANN WRIGHT: Indeed, it is just—it’s breathtaking, the amount of things that are in this communiqué. Everything from denuclearization of the Korean Peninsula, to a peace treaty, to no more war on the Korean Peninsula. To establish a peace regime. To have family reunification starting on August 15th. To connect railroads and roads. To cease all hostile acts on land, air, and sea. To transform the DMZ into a peace zone. To have a maritime peace zone in the western, northern limit of the area. To hold military talks in May. That President Moon will go to North Korea in the fall. And to say there will be disarmament in a phased manner as tensions are alleviated. It is a really beautiful, beautiful document that will require a lot of work, that’s for sure, and a lot of commitment to make sure that this doesn’t get derailed in any way, but it is really a very comprehensive statement of peace for the Korean Peninsula. AMY GOODMAN: Now, you are a retired U.S. Army colonel. You quit the State Department over your opposition to the war in Afghanistan. You are a fierce critic of President Trump. But do you believe that President Trump deserves credit for some of what has taken place today? ANN WRIGHT: Absolutely. Ninety-nine percent of the things that President Trump is doing, I don’t agree with, but even when he was running for office, when he said “I will talk to people. I will talk to Kim Jong-un,” it was like, “Well, that’s a very good statement.” And indeed, he has followed through, saying that he will. And I certainly hope that they do have a very good summit in late May or in June. It is very important that the United States follow through with what the South Korean government and the North Korean government have done. And I certainly wish President Trump goodwill for this, and I wish him goodwill if he would approach other aspects of our globe for peace, for the better environment, for keeping our planet safe for everyone. But yes, he deserves a little bit of credit for this, and I’ll give it to him. AMY GOODMAN: As the Korean leaders embraced each other on the demilitarized zone, the White House released the photograph of Mike Pompeo, who was secretary of state nominee at the time—he has been approved—and Kim Jong-un in that secret Easter-day meeting. The significance of that, Ann Wright? ANN WRIGHT: Well, as director of the CIA at the time, to have sent the intelligence chief of the United States instead of the secretary of state—although by that time, Tillerson I believe had already been fired. But President Trump having in mind the nomination, I guess, of Mike Pompeo to become secretary of state, it does put him in a position that he has at least met Kim Jong-un. Hopefully, they will develop some sort of a relationship so that the United States and North Korea can have a reasonable relationship. It is very important that we give credit where credit is due. I hope not only is he able to smooth out relations with North Korea, keep relations with South Korea, and I hope he is able to rebuild the State Department, which so desperately needs to have some attention from the Trump administration. AMY GOODMAN: And what does this mean for the, what is it, something like 28,000 troops in South Korea, U.S. troops in South Korea, today? ANN WRIGHT: Oh, I can imagine that those 28,000 troops are just breathing a sigh of relief. To have been assigned to North—to South Korea with all of the tensions, it must have been very, very difficult for all of the U.S. military there as well as the civilians of South Korea, having to live under all of the rhetoric that has been going on. But I feel quite certain that our U.S. military is breathing a great sigh of relief with this agreement between North and South Korea. AMY GOODMAN: Ann Wright, you crossed the demilitarized zone as a member of Women Cross DMZ in 2015. Did you think this moment can come, and do you see a unified Korea in the future? ANN WRIGHT: Well, indeed. In 2015, with Christine Ahn, with whom I was with this afternoon here in Honolulu as we watched the very beginning of the talks between the leaders of North and South Korea. And of course, this has been our dream, not just Women Cross the DMZ, but all of the people that have been working on the issues of the Korean Peninsula for decades. And indeed it is just—it is a remarkable occurrence today that our dreams are really coming true. If this agreement is implemented in the way that it is written, it will really provide such a relief to both the people of North Korea and South Korea that they don’t have to live under the threat of potential military action, that indeed there can be cooperation on economic areas that will help North Korea. The people in North Korea are not dummies. They are very smart people, and I think they will be able to use this opportunity very, very well to increase their standard of living. And the family reunification part of this, that the people of the Korean Peninsula who were artificially divided in 1945, that indeed they will be able to resume family relationships, and that the Korean Peninsula will become a safe place, a place of peace for the world. AMY GOODMAN: We are currently showing live footage of the two leaders, South and North Korea, as they hold hands, continue to embrace each other. Do you think, Ann Wright, that the crippling sanctions that President Trump imposed against North Korea drove Kim Jong-un to this point? And what do you think we could see if North Korea is opened up? ANN WRIGHT: Well, the pressure that the international community has put on North Korea definitely had to have had some effect on Kim Jong-un’s decision to be more open. However, I think the greater thing was that, indeed, because they have developed nuclear weapons, that they feel secure that they could defend themselves from any type of regime change, which is still the policy of the United States. Although, hopefully, by the tweet that President Trump did this morning, regime change is no longer our policy. But I think between the confidence that Kim Jong-un had because of the nuclear program and the increased sanctions that had to be hurting, those things combined put him in a position that, “OK, let’s deal with the West.” I think he is dealing very well with it. And the numbers of or the amount of natural resources that they have in North Korea, the intelligence of the people of North Korea—I mean, with all of the sanctions and all of the things that the international community have done to them, they still developed nuclear weapons. They still put—they developed ICBMs. They put satellites into space. It’s not like under all those sanctions that they were just totally crippled. They are very smart people, and I think with a little bit of a chance, that we will see remarkable things happening for the people of North Korea. AMY GOODMAN: Ann Wright, I want to thank you for being with us. Retired U.S. Army colonel, a member of Women Cross DMZ, speaking to us from Hawaii today about this historic development on the Korean Peninsula—the meeting of the South and North Korean leaders across the DMZ. We will continue to cover this. Tune in next week and over the weekend for the latest developments at Democracynow.org. This is Democracy Now! When we come back, we go to Capitol Hill, where the EPA Administrator, Scott Pruitt, who many say has rolled back environmental regulations to an extent we have not seen in decades, was grilled on Capitol Hill.